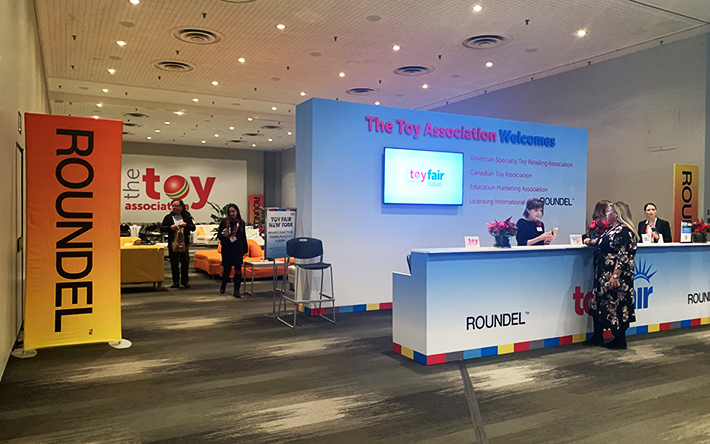 Make a Big Deal Out of Your Brand at Toy Fair 2020! 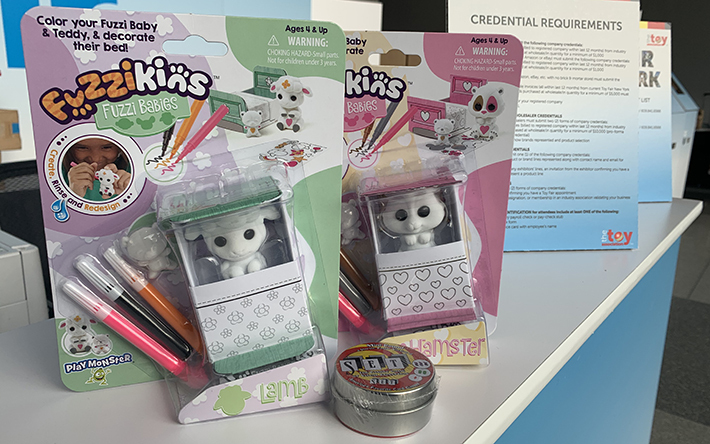 Stand out above the competition and drive sales at Toy Fair 2020 with high-impact advertising and promotional opportunities to help you do a year’s worth of business in just four days. 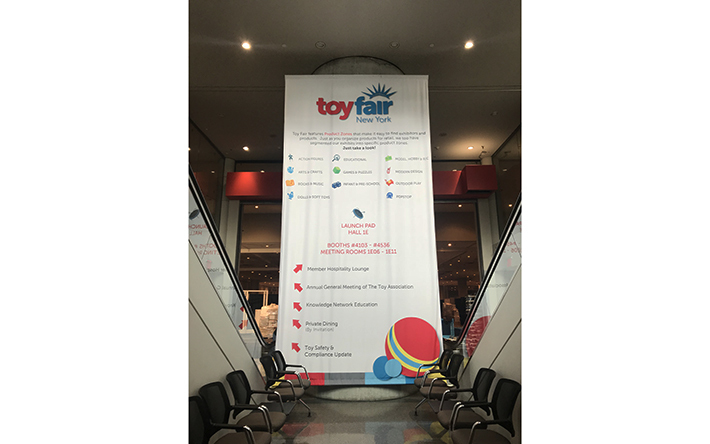 Thousands of buyers from over 50 distribution channels* come to Toy Fair looking for innovative products not found elsewhere. Set yourself apart from the competition and communicate with decision-makers looking for what’s new and what’s hot. Increase your visibility for greater show success! For information about all available promotional and advertising opportunities, contact Laura Mangiaracina at 646.454.5589. 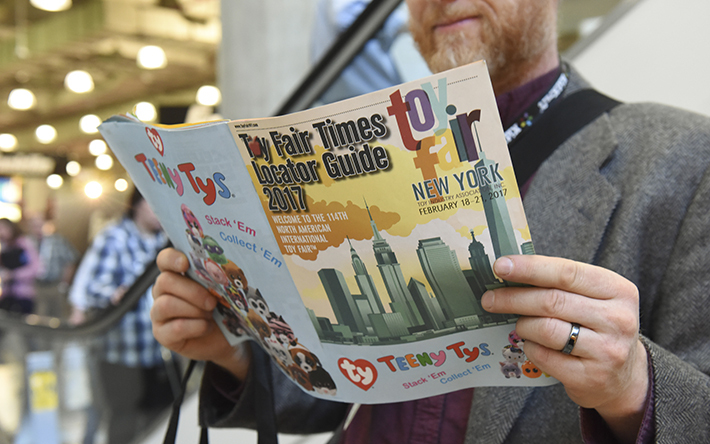 The Toy Fair Times Locator Guide is a robust publication that provides an uncompromised value for advertising. 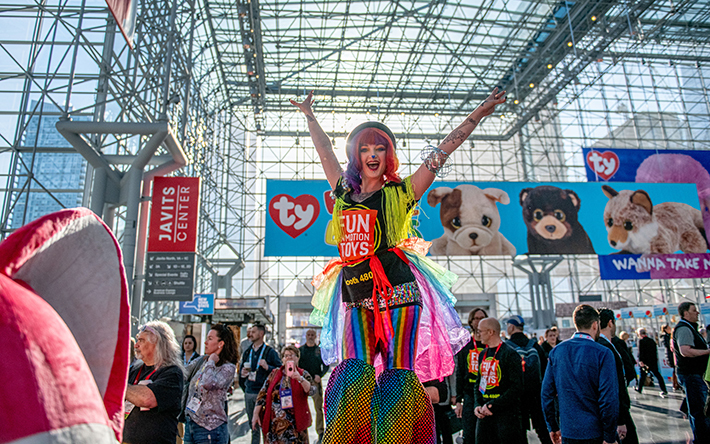 The piece combines powerful editorial with valuable tools to help Toy Fair attendees navigate the show including a list of exhibiting companies and their booth number, detailed information about the show, daily activities, shuttle bus schedule, floor plans and a complete outline of the education program. Take a look at the 2019 Locator Guide here. Reach influential toy professionals looking for your specific product category before the show begins. 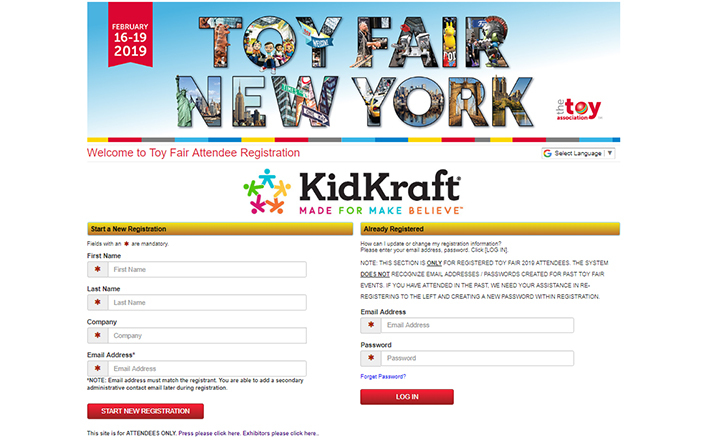 As the featured exhibitor in one of Toy Fair’s nine Product Zone emails deployed in late January 2020, you will stand out amongst your peers and give Buyers the opportunity to explore your brand as they make their Toy Fair plans. 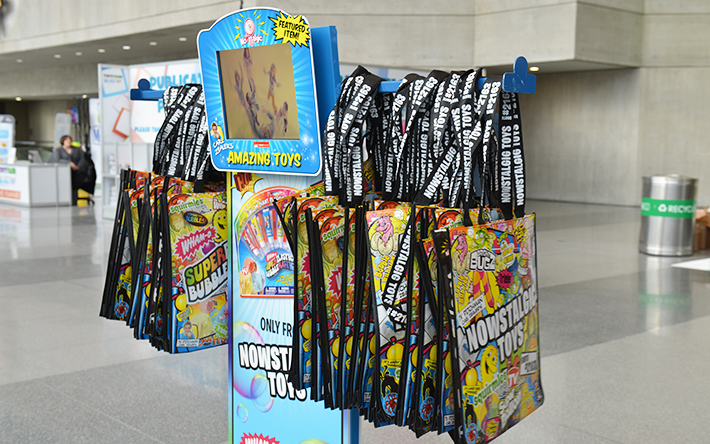 Put your brand in the hands of Toy Fair attendees – literally! 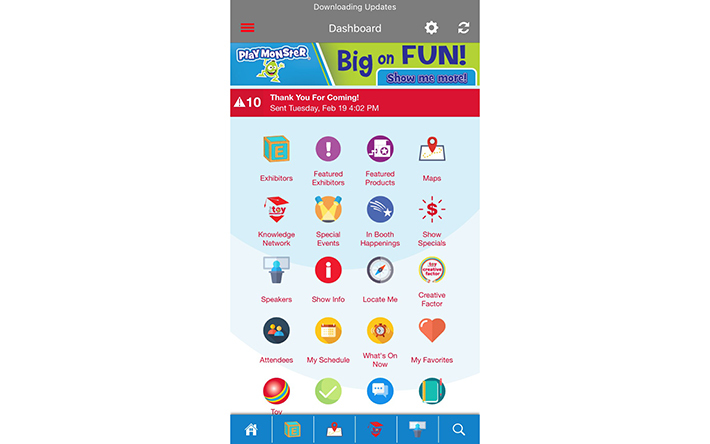 With Toy Fair Mobile, attendees can view the interactive floor plan, search for an exhibitor and booth, view the event schedule and much more. With more than 85,000 clicks on exhibitors, you have the opportunity to enhance your listing and showcase your products making it easier for attendees to learn about your company and direct them straight to your booth. Content from Mobile Showroom Listing upgrade automatically appears in the online directory. The app will be available for download for iPhone and Android users in the Fall of 2019. 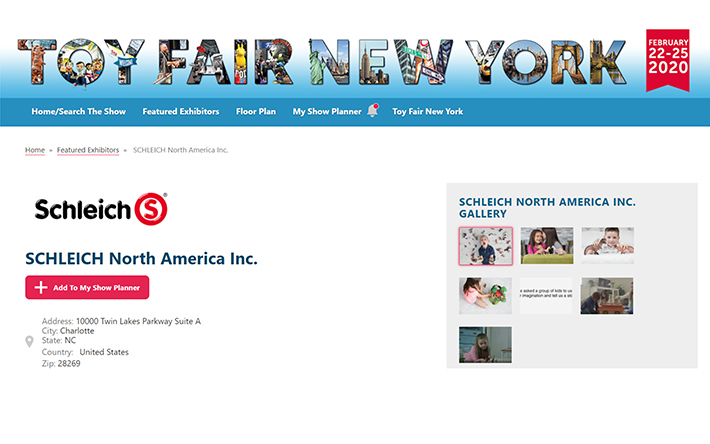 The Toy Fair 2020 website houses the official exhibitor directory, floor plan, and show planner attendees use to find new products and services while planning their visit to the show. Upload content, get priority placement and be a featured exhibition with one of the many available packages. Content from the Silver Package automatically appears in the mobile app. 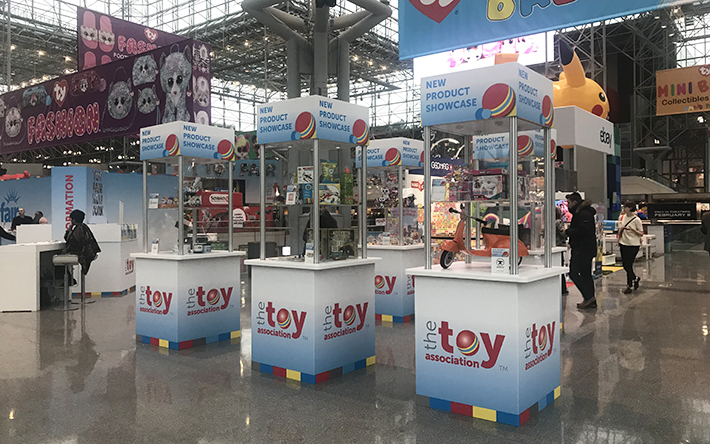 Toy Fair’s Product Zones provide buyers a focused shopping experience and offer exhibitors a great opportunity to be in the right place on the show floor. Be your category leader and sponsor your zone. Sponsor booth must be located in product zone for sponsorship. Announce your brand, product or new property in a BIG way by hanging your message from the rafters! Banners are strategically placed in high-traffic locations and are instantly visible from all registration areas. There are a variety of sizes and locations available to make a powerful impact. Limited space is available in select areas of the Javits Center. A unique branding opportunity is right at your feet! 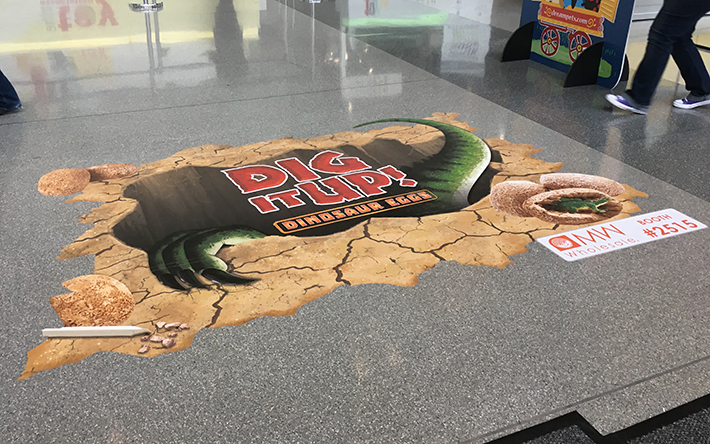 Thousands of attendees will walk by and be sure to notice your floor graphic placed in highly visible areas of the Javits Center lobby and the exhibit floor. Make a first and lasting impression with branded decals on the North Concourse doors. Capture the attention of every attendee as they arrive at the show and be their last thought when they leave for the day. A variety of packages are available. Make a splash on the Level 4 Terrace Glass and grab attention of buyers as they enter the North Concourse. This is prime real estate to showcase your latest product and brand for all to see. Can’t be everywhere at once? 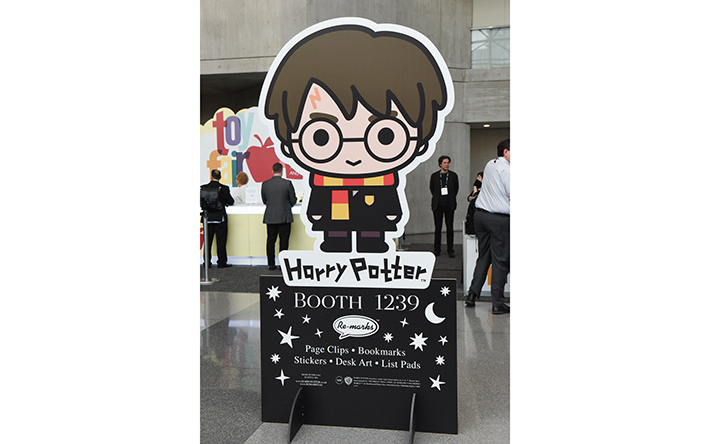 Place your brand in front of every attendee at the show with these economical cut-outs. Multiple locations available in high-traffic registration lobbies and exhibit hall entrances. Step up your marketing! Be the first name buyers see upon arrival, and be a part of their Toy Fair experience every step of the way as they continuously move between exhibit levels. 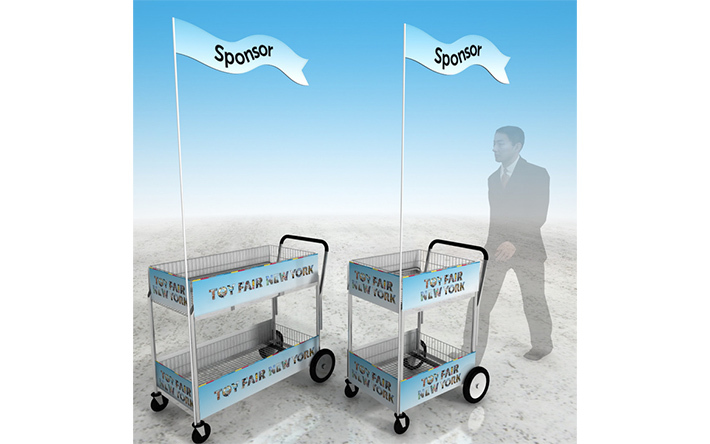 Promote your company on all levels at Toy Fair! 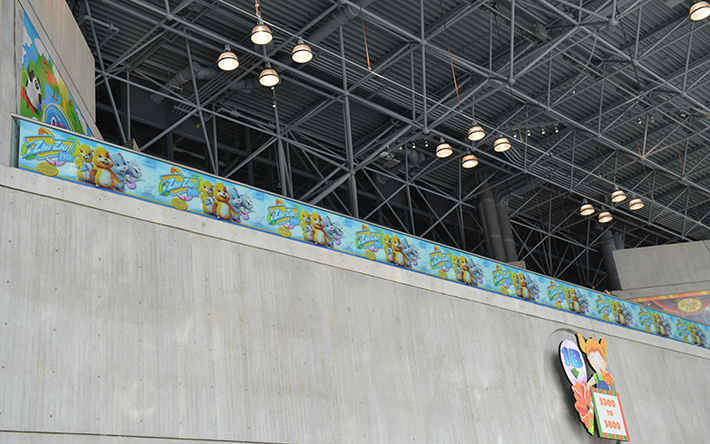 Place your company’s logo and booth number on decals adhered to the many escalator panels throughout the Javits Center. 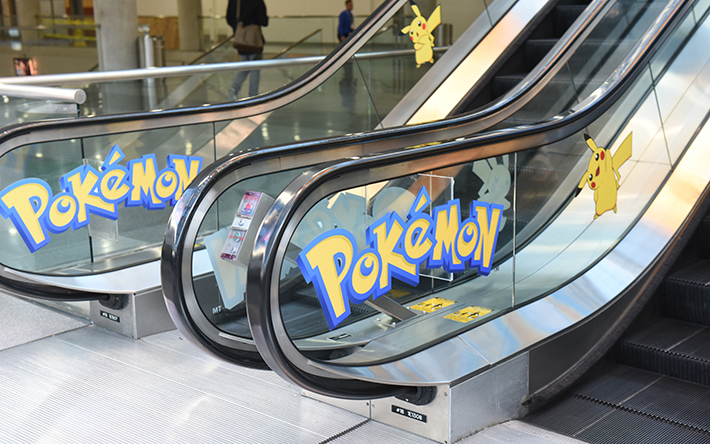 Sponsored location includes both the up and the down escalator. Simple and true. 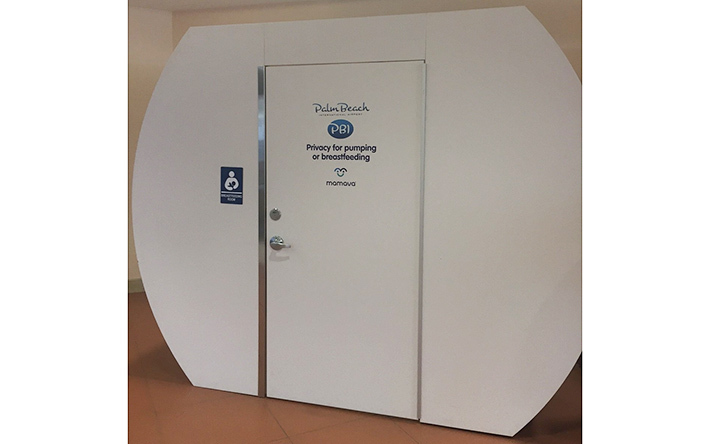 At some point, every Toy Fair attendee will visit the restroom, so why not take advantage of this all-important location? 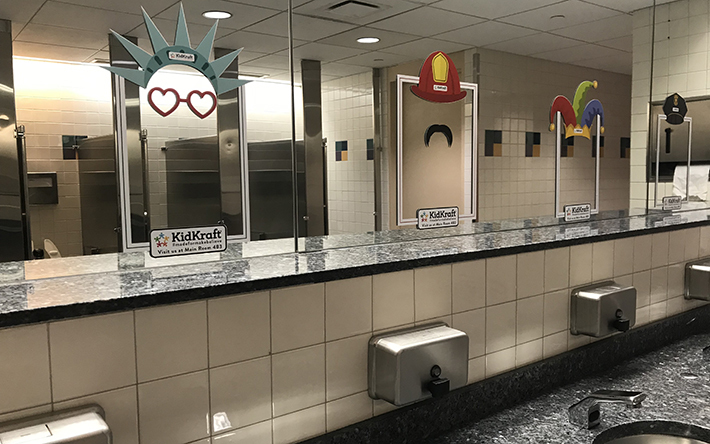 Place decal signage on mirrors and stall doors in one or more of the show floor and public space restrooms during the show and call attention to your brand. But first, coffee. 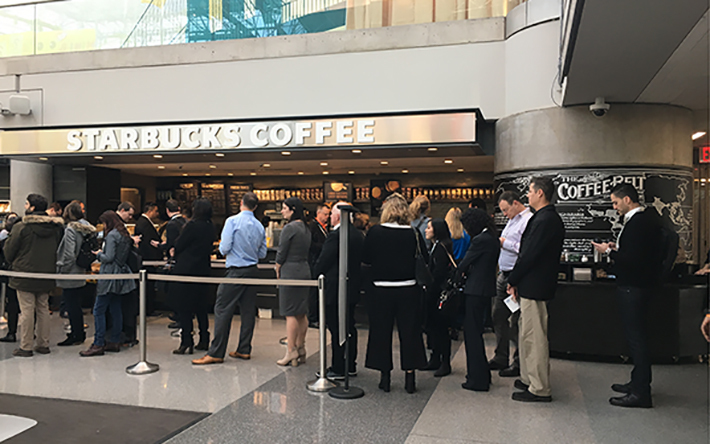 If you have been to Toy Fair, you know that the lines at the two Starbucks locations at the Javits Center get VERY long during show days. Take advantage of this captive audience while they grab their much-needed caffeine fix with a package that includes floor decals and table decals. 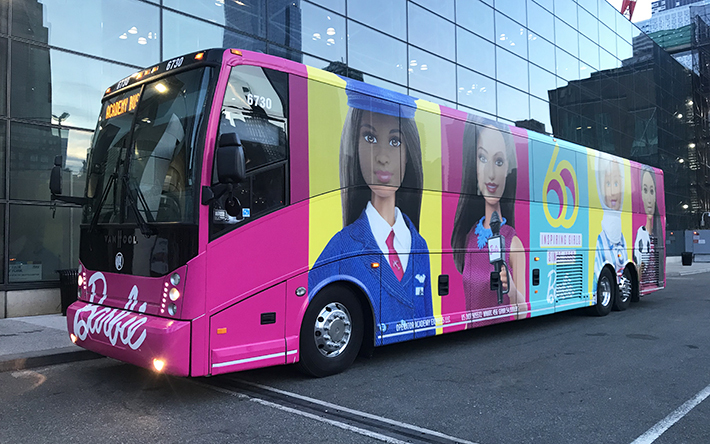 Grab the attention of thousands of potential customers with Shuttle Bus Window Decals You will be the talk of the town as your Toy Fair bus shuttles show participants between midtown hotels and the Javits Convention Center during AM and PM hours on all four days of the show. Bus advertising in New York City delivers a truly dominant competitive advantage. Located in prime, high-traffic locations adjacent to the many Level 1 exhibit hall entrance doors, the Indoor Column Wraps are a great way to get noticed by Buyers as they make their way through the registration lobby and into the exhibit halls. 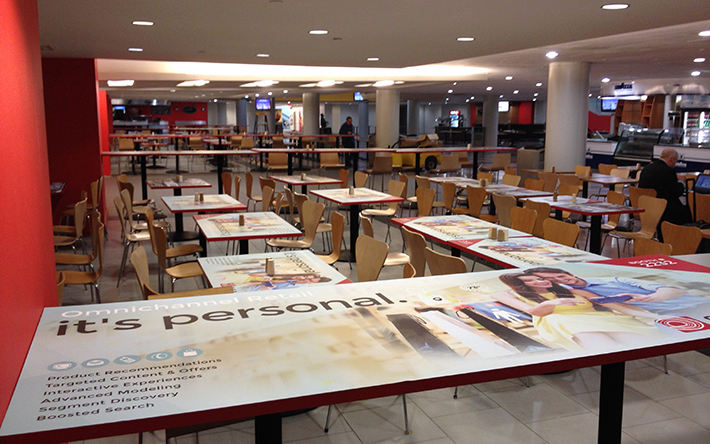 Wrap your brand on one of many available locations sure to make a BIG impact. 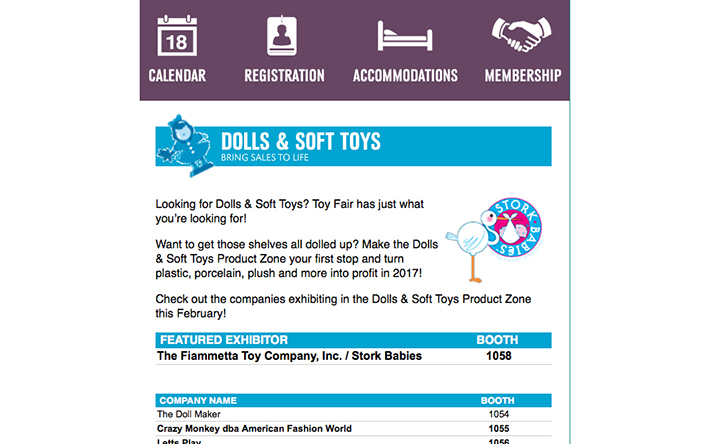 Keep your company name and logo top-of-mind and be at eye level of all Toy Fair attendees. 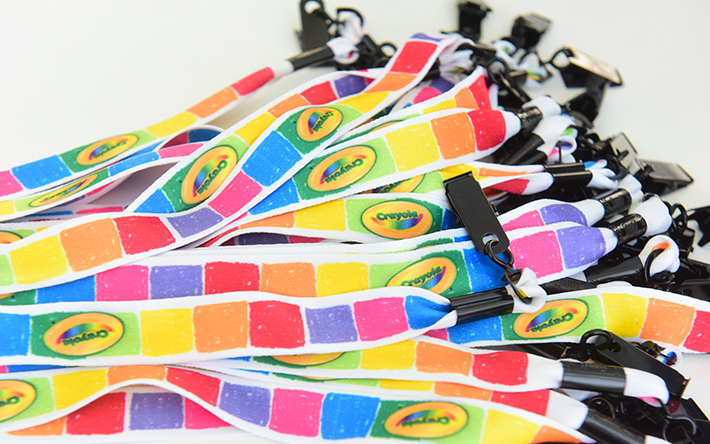 These lanyards are given to all registered buyers and are a great way to see your brand everywhere. When you sponsor the official Buyer Show Tote Bag at Toy Fair, registered buyers carry your name and marketing message wherever they go. Take advantage of this targeted distribution and get in the hands of all registered buyers who visit the show. Get your giveaway in the hands of buyers as soon as they walk in the door. Provide them with specialty item when they pick up their badge at the registration desk and get noticed right away. Toy Fair attendees accumulate a lot of product info and giveaways over the course of four days. Why not give them the bag to carry it home. The Official Show Bag is placed on self-serve racks throughout the registration areas offering wide distribution. 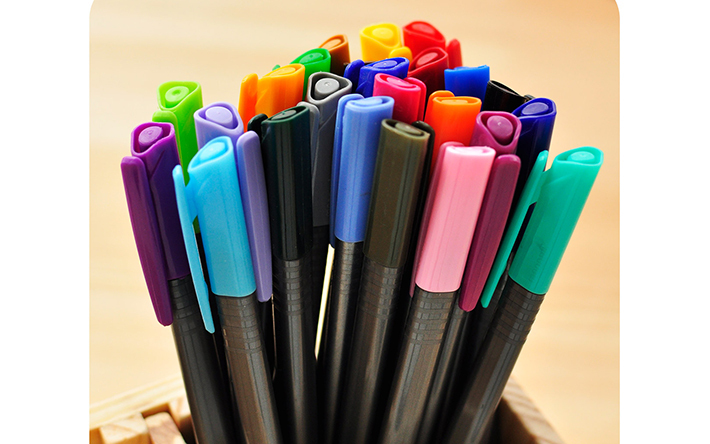 Put your company logo, web address or booth number on the pens used by thousands of Toy Fair attendees at all registration locations during the show. 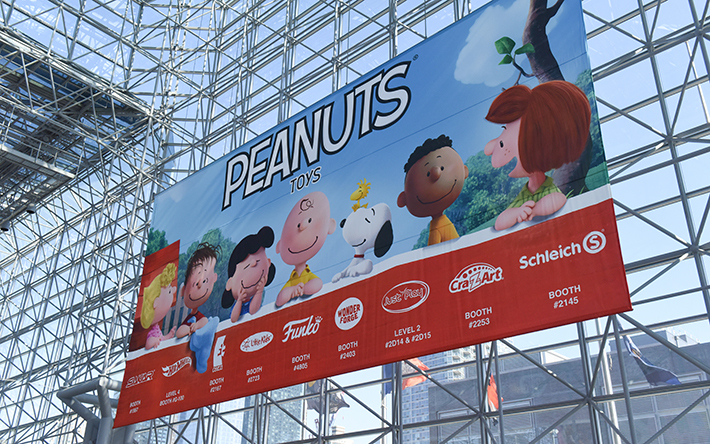 This exclusive sponsorship gives you the opportunity to be front and center as attendees make their way into Toy Fair 2020 to see YOU! It’s alive! 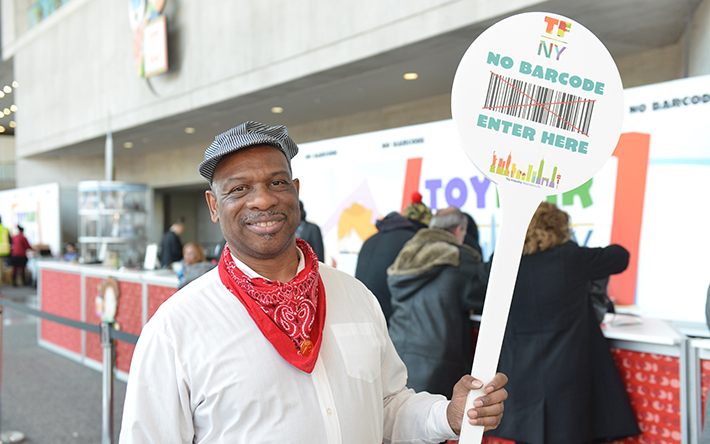 Breathe life into your presence at Toy Fair by having your “walking advertisement” or “living banner” in all Javits Center public areas. 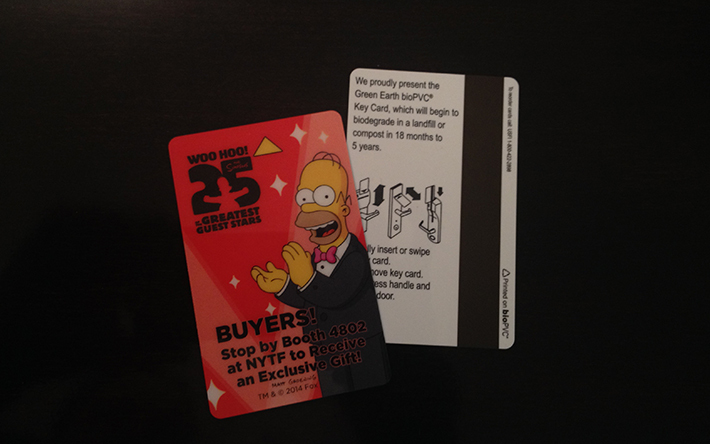 It’s sure to create a buzz for your products, characters or properties. Create a photo opportunity and entertain attendees while reaching your target audience and making a lasting impression. Guidelines and restrictions apply. 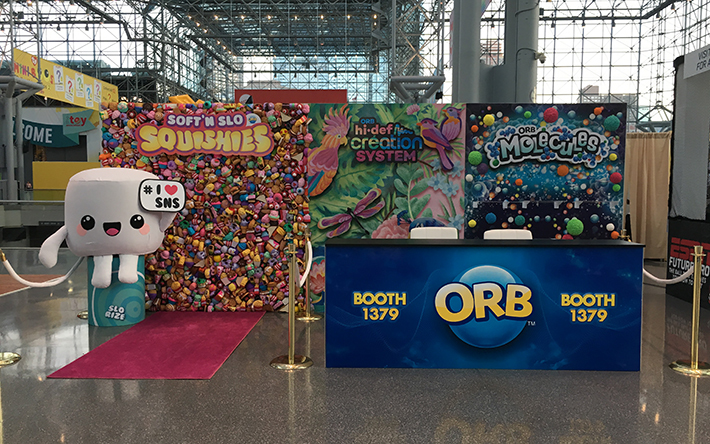 Put your brand on display in the Toy Fair lobby of with an outfitted brand ambassador. Distribute marketing collateral, demonstrate your product and participate in the Opening Day Parade all while capturing the attention of attendees with this unique exposure. 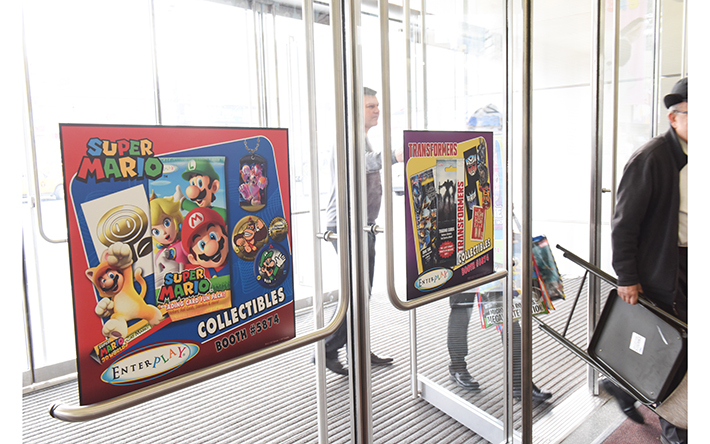 Show your product in these exclusive, dynamic showcases located at the front entrances of the Toy Fair exhibit halls. 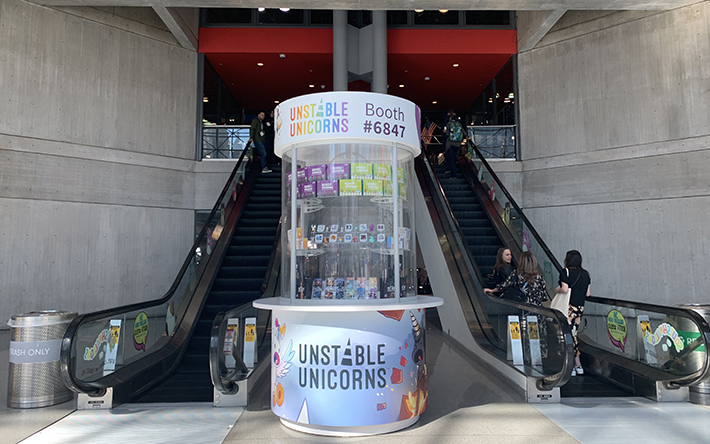 Designed to give Buyers a sneak peak at your products and lead them to your booth, these showcases garner maximum visibility in high-traffic locations. Both large and small showcases available. 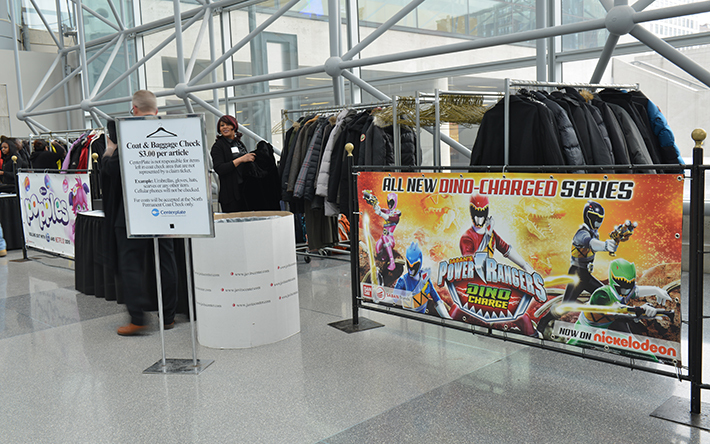 Information guides stationed throughout the Javits Center during Toy Fair are a valuable resource for attendees. Attract attention by dressing these guides in your company-branded clothing or other merchandise. 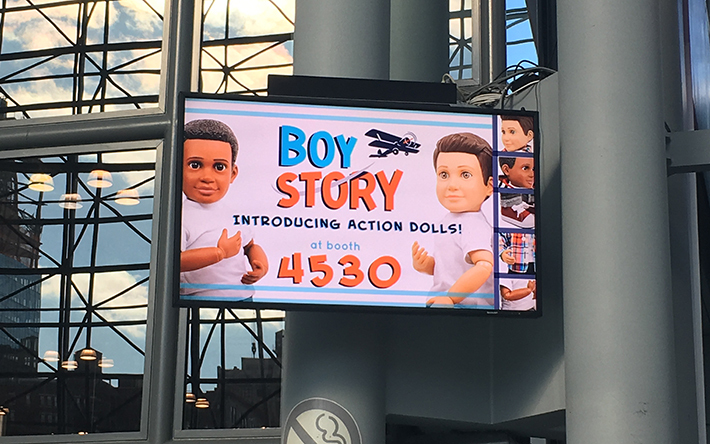 Drop a larger-than-life promotional display in the front lobby of the Javits Center and guarantee that all Toy Fair attendees see you! This is a proven booth traffic and sales generator so don’t miss out. Limited space is available in select areas of the Javits Center. Be the center of everyone’s conversation with a valuable sponsorship throughout the busy food court at the Javits Center. This delicious sponsorship opportunity allows you to mix and match decals, signage, cups & napkins, food vouchers and more. A variety of options for this sponsorship are available. Hungry for attention? Grab it with this exclusive sponsorship of the Centerplate Mobile Food Carts that roam the exhibit halls during the show. With 360 degree branding and the opportunity to provide a giveaway with every purchase, attendees are sure to remember you when hunger strikes. Winter in New York means that every attendee will need to check a coat before they hit the trade show floor. 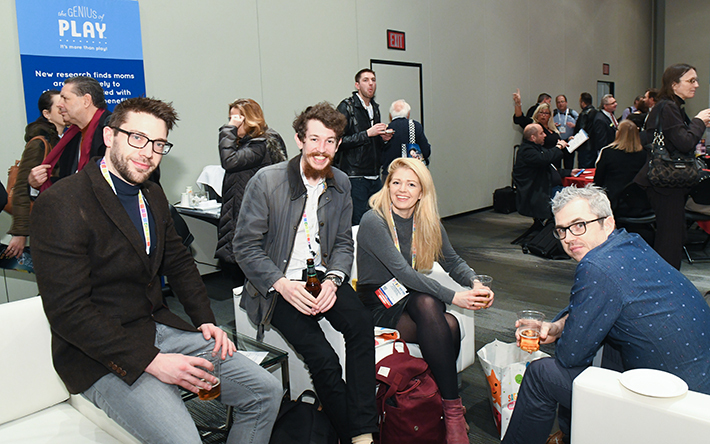 Warm them up to the opportunity of visiting your booth with a sponsorship entitling your company to brand the coat check locations throughout the Javits Center. Thousands of rooms in hotels around New York City will be a home away from home for Toy Fair attendees. When you purchase an in-room sponsorship at the Top 3 Toy Fair hotels, your brand is literally seen every day and night throughout the show. Let attendees begin and end their day with your company’s branding in their hand…and mind! Choose from key cards, daily room drops and turn down service to propel your business from the show floor to sleeping rooms. 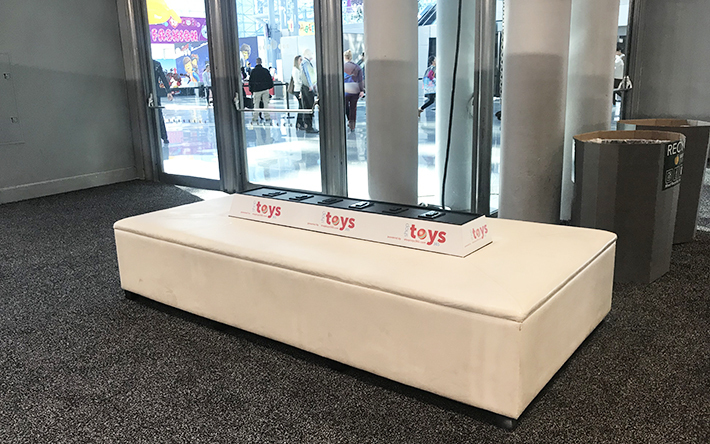 Strategically placed on the show floor, these unique ottomans offer Buyers an on-floor oasis to rest their feet and recharge their batteries. Outfitted with 6 double outlets, these customizable ottomans give you the opportunity to highlight your brand with a strategically placed decal offering 360 degrees of visibility. Being an exhibitor at Toy Fair for the first time can be very overwhelming. Let us help you announce your participation and connect with Buyers with an exclusive promotional package made just for first timers like YOU. A variety of packages are available to first-time Toy Fair exhibitors only. 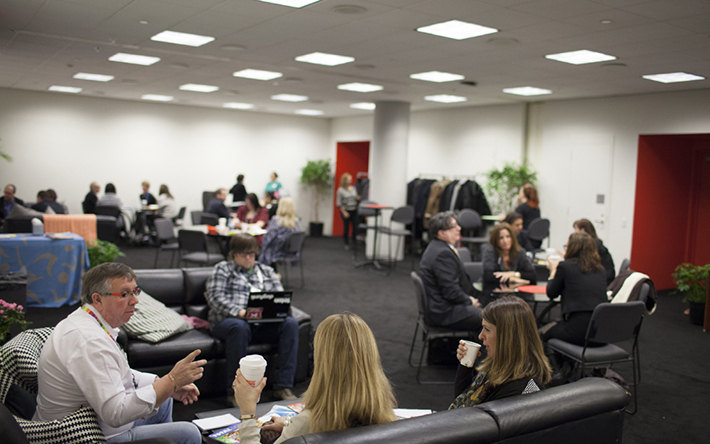 Air your commercial on all 70 televisions in Javits Center common areas during show hours on all four show days. Both 30- and 15-second commercials are available to attract buyers to your product and your booth. Want more? Purchase a discounted bundle and see your ad appear at the Dallas Market Center during Toy Fair Dallas 2019 as well! With more than 400,000 square feet to explore, thousands of buyers and retailers from the U.S. and around the world will consider this lounge their off-the-floor oasis and a place to renew, refresh and remember who made it possible. Toy Association will provide welcome signage to include sponsor’s name and logo. When you sponsor the Member Business Center, you are providing an office away from the office and making it easier for Toy Association, LIMA, ASTRA and Canadian Toy Association Members to conduct their business while at the show. They will surely remember who made their lives easier. 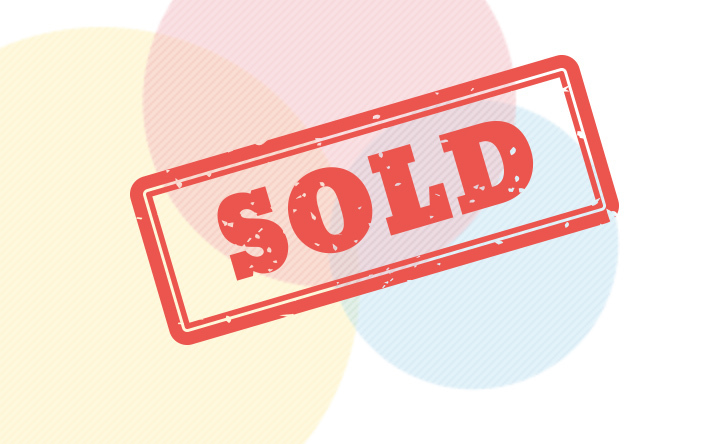 The Toy Association will provide welcome signage to include sponsor’s name and logo. Toy Fair is a media magnet! 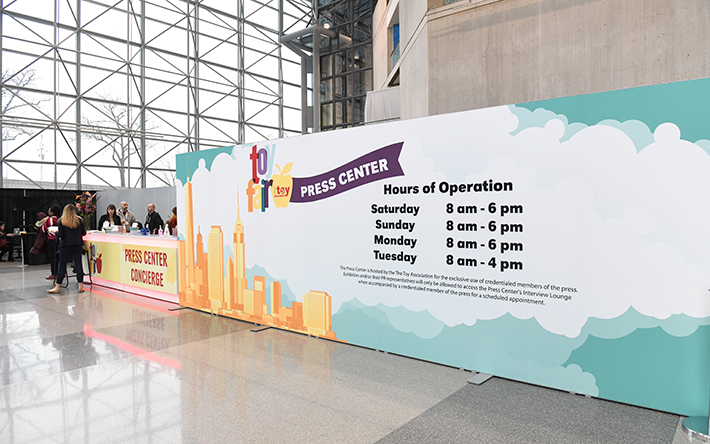 More than 1,000 global media representatives attend Toy Fair and use the Press Center throughout the show to meet, write, interview and work their media magic. A variety of options is available for your company branding to appear throughout the Press Center and on items like the Official Press Tote Bags, Lanyards, Technology and more! If your strategy is to maximize media exposure, then this is the place for you! You know the phrase “a way to a man’s heart is through his stomach”? In most cases, it’s true. Same goes for Toy Fair attendees! 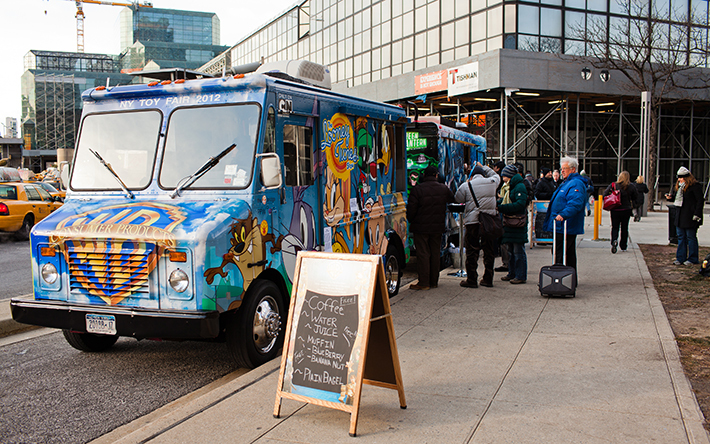 Park your branded food truck outside the Javits Center and see the buyers swarm. Sponsor is required to provide truck and follow the Toy Fair catering guidelines. The networking does not stop when the show closes. Get your brand in front of international attendees at this exclusive, invitation-only event. 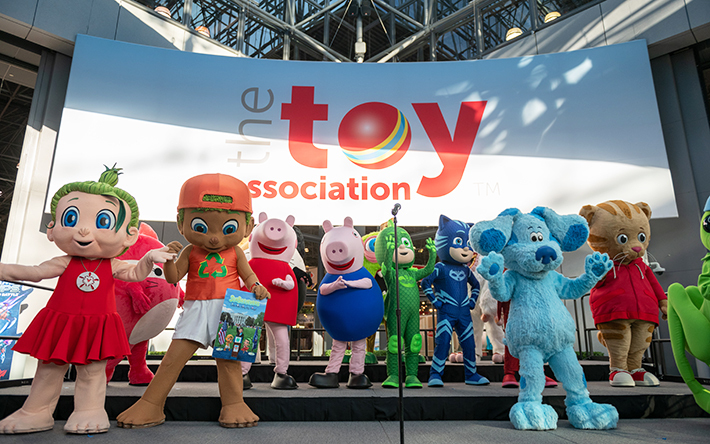 Toy Fair’s international attendance grows year after year. This is your chance to meet and greet this global audience in a relaxed atmosphere. The sponsor is welcome to invite up to 5 guests in addition to staff and can customize the décor in the reception space to feature their product at their expense. Market your product or brand in a different way – directly to moms attending the show. Provide nursing mothers a serene and calming room for nursing and/or pumping when they desire a safe, quiet and comfortable place. 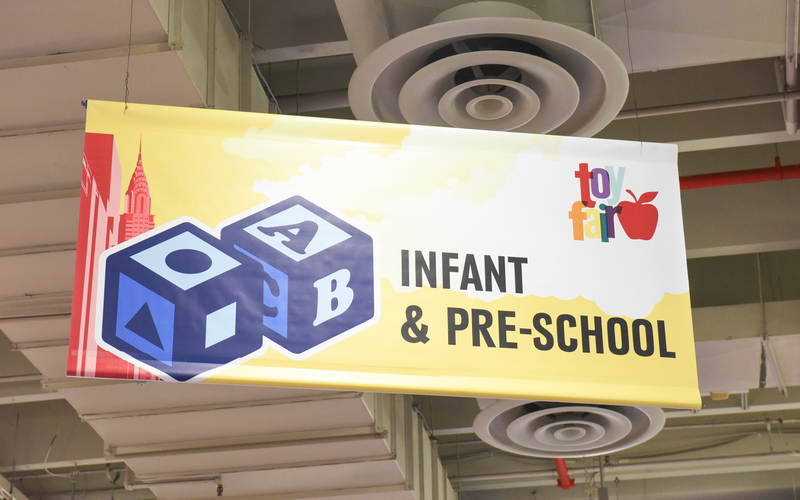 Take a lunch break and join us at Toy Fair Recess offered daily in the Javits Center Food Court. Sponsor one day or all four days of recess and help attendees find their inner child with rousing games of Simon Says, Freeze Dance, 4-Squares and Hot Potato with your name attached to the fun. Contact Laura Mangiaracina, manager, advertising, sponsorship and promotions.